The first step to evaluating the health and vibrancy of a space might be to sit down. That is, if you can. Today, more than forty-five years have passed since Holly Whyte issued a call for more and better seating in New York City in his essay, “Please, Just a Nice Place to Sit.” Written in 1972, the piece decried the failure of local designers and architects to provide comfortable and usable spaces. Noting features like sawtooth-edged rails which preclude comfortable sitting in public spaces throughout the city, Whyte’s call to action showed that the best and most well-loved spaces around the city were those that were the most “sit-able.” Whyte took readers on a journey around the benches and ledges of the city, examining places like the steps of the Metropolitan Museum of Art or the New York Public Library as powerful places for sitting and socializing. The places that were the most sitting-friendly were the most sociable; and the places that were the most sociable were the safest. 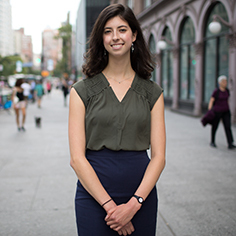 Holly Whyte implored the city to change zoning rules to encourage the creation of more sitting space, calling for “as many feet of sitting space as there are feet in the outer dimensions of the property.” By becoming a “front-row seat” to the city, with inviting and engaging spaces for people to meet or watch day-to-day life unfold, plazas and other spaces can take advantage of the activity that tends to cluster around their entrances and on street corners. A space can improve through the seemingly simple assurance that ledges can actually fit the behinds of the people that need to sit, and that there are amenities like food, trees, and water features nearby to both shelter and entertain. The way people sit determines the way they interact; the availability of seating draws people to a space, and it can be the force that brings strangers together to talk. Whyte's wisdom remains true today, even in an era still characterized by hostile architecture meant to deter lingering. As so-called “leaning benches” begin to proliferate at bus stops and Subway stations around New York City, some have declared a so-called war on sitting. Often deployed to deter people experiencing homelessness from using a space, these “defensive” urban features undermine any sense of welcoming offered by the landscape of a city. 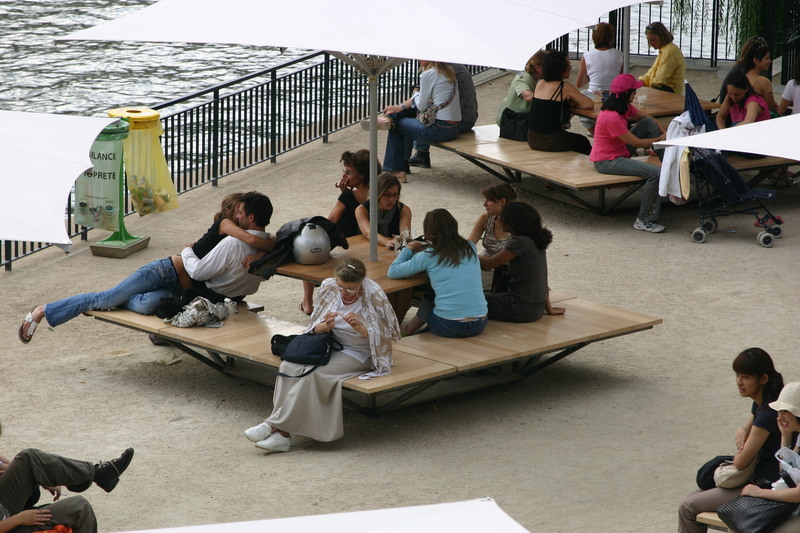 This three-pronged approach allows people to design their own experience of a public space. Seating can be a part of the way that a space triangulates; in other words, it often becomes a gathering point where friends and strangers can interact. In Philadelphia, we see this at work in the City Hall courtyard, where a modular stage can be split up and turned into tables or benches. Because the pieces of the stage are so versatile, they allow for people of all ages to come together for a concert or simply to eat lunch. As a bonus, they are linked to rainwater-collecting umbrellas — adding an element of environmental education to the now-lively space. 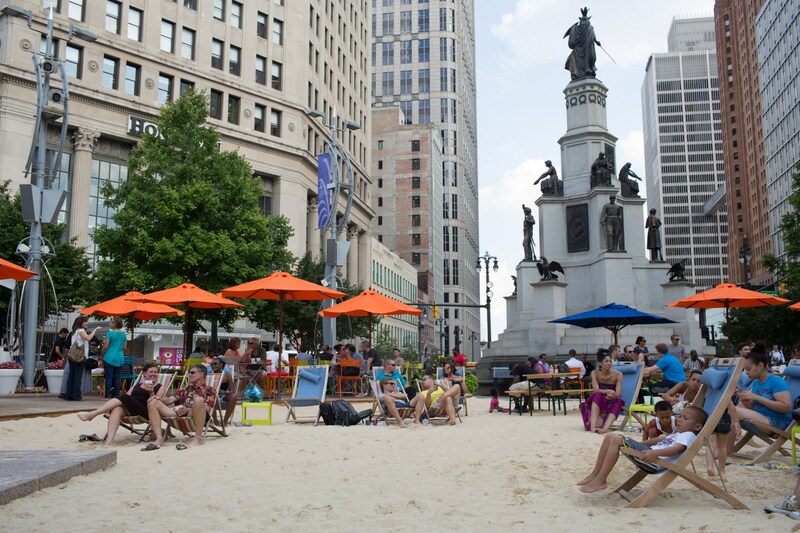 In Detroit, the Beach at Campus Martius is an iconic place to relax. Once an under-used area of corporate buildings, the park and its beach are now a sandy respite and meeting place for locals and office workers. The Beach provides low-slung chairs, a communal table, and other moveable seating throughout the park, all bringing people together to a space that brings out lively exchange that the area lacked for so long. Paired with the sand between the toes of visitors, the multiple options for sitting down to enjoy the park add to its unique appeal. Harvard Yard used to be a place to pass through with very little seating, never a place to linger. Seen as a formal space lacking in activity and recreation, it often lay vacant. The addition of seating was enough to completely turn it around; Luxembourg-style chairs came on the scene by the hundreds, quickly becoming a symbol of the space. Suddenly, instead of going straight back to their dorms after class, students began to linger in the space. Harvard’s Science Plaza also became a destination, starting with seating centered around food trucks. Mixing moveable Adirondack chairs, picnic tables, and beanbags, the space showed off a variety of seating to reflect a variety of activities. Harvard’s spaces were no longer unwelcoming, becoming a true hub of campus activities. There are examples of best and worst practices all over the world. 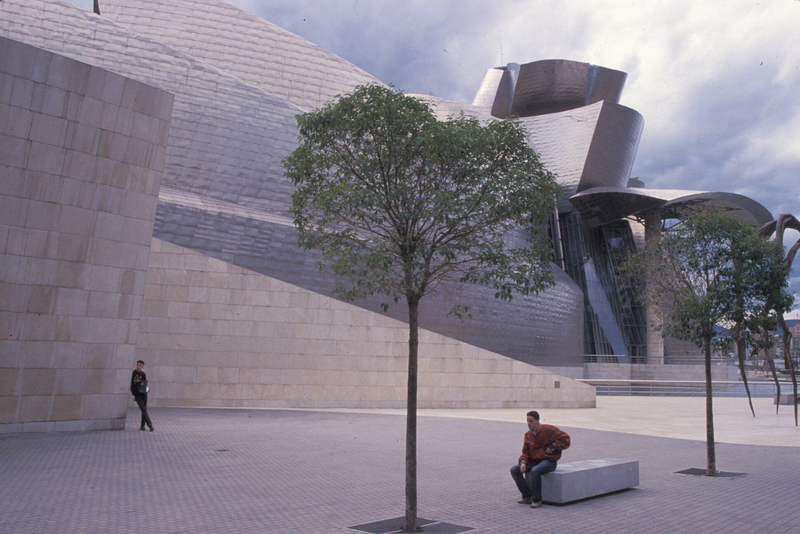 From spare, unengaging seating seen in Bilbao, Spain, to the "perfect bench" in Paris, one can learn about what works best by watching how people use a bench or a seat. The importance of a good place to sit cannot be understated. From PPS’s earliest signature projects in Rockefeller Center and Bryant Park, overcoming fear of “undesirables” by introducing comfortable seating has worked to disrupt the trend of “hostile architecture.” Issues of equity and inclusive design remains a major issue, and the placement and design of seating design too often determines who gets to sit and for how long, and who feels they belong in the space. 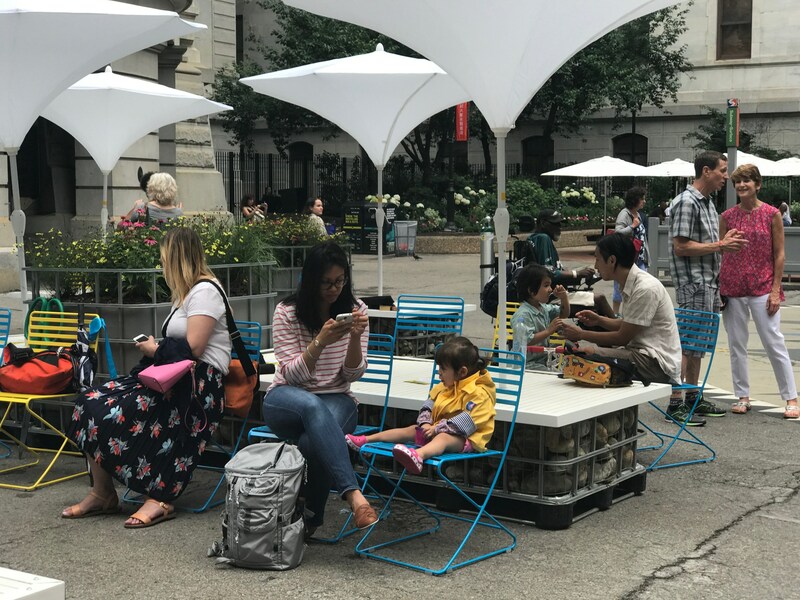 Seating is an indicator for the health of a space and the community that uses it, and it continues to be foundational to PPS’s broader placemaking work and global movement building. Fixing seating can fix a space, bringing back the characteristic interactions that define what it means to use a public space. Whyte called for a return of the pleasant chaos of a busy public space, brought about by a mere place to sit: with “more schmoozing, more picnicking, more kooks and screwballs.” In other words, more life.